If you are accustomed to buying tomato seedlings from the local garden center, you might not be sure how to start tomato seeds. Don't let this deter you, as starting your own tomato seeds is an easy task, and opens up a whole new world of heirloom and specialty tomatoes generally only available as seeds. Once you are familiar with the basic procedure, you should be able to simply pick out your necessary supplies and get started. Starting tomato plants indoors too late or too early can cause problems. Waiting too long to start your seeds can mean that your plants may not have enough time to mature and set fruit before autumn frost hits. Starting too early can leave you with large, rapidly growing plants before the soil is warm enough for transplanting. Pot space and indoor light levels may run short as plants grow larger, weakening the plants before they even make it too the garden. 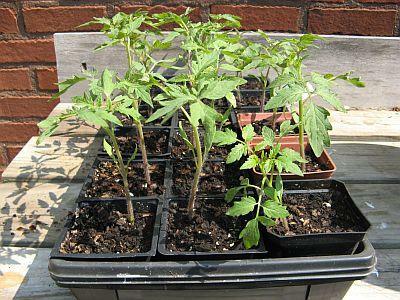 Most gardeners like to start tomato seedlings about six to eight weeks before the last expected frost date of the season. If you are unsure when this occurs in your area, you can look up the dates based on your USDA planting zone. Starting tomato seeds is as simple as deciding on a variety, choosing a medium and sowing the seeds. After that, all you need is time and patience. Bagged Seed Starter: Usually a mix of peat moss, perlite and vermiculite, pre-mixed seed starter is sterile, convenient, and effective. Home-Mixed Starter: You can cut costs slightly by mixing your own sterile starter mix using equal parts perlite, vermiculite, and peat. Each of these is available individually at garden centers. Peat Pellets: Peat pellets are convenient and sterile, and are great fun for gardening with children. Dry, each peat pellet is approximately one inch (2.5 cm) in diameter and just over 1/4 inch thick. When moistened, pellets swell into soft cylinders of peat ready for seeding. Peat pellets are fairly inexpensive, but may become costly or time consuming if you are planting a large nuimber of seedlings. Potting Soil: Bagged potting soil is an easy substitute for seed starter mix, but requires sterilization before use. Garden Soil: Garden soil is free, convenient, and easily obtained. To prevent damping off of the delicate seedlings, Perdue University's department of horticulture recommends that gardeners sterilize soil in the oven before using it for seed germination. Fill containers with soil and place in a 220F (105C) oven until an inserted thermometer reads a minimum of 160F (71C). Sterilization offers the additional benefit of killing most weed seeds that may be hidden within the soil. To prevent mold and bacterial growth, use only sterilized containers for any medium you decide to use. Once you have selected the appropriate medium, you are ready to begin planting your seeds. Moisten the medium and fill containers to 3/4 inch (1 to 2 cm) from the top. Lightly firm and level the medium. Using a finger or the blunt end of a pencil, make a small hole approximately one-quarter of an inch (6 mm) deep in the medium. Drop one seed in each hole and carefully fill in remaining space. Keep seeds warm. If they are going to sit in a cool area such as a garage or basement, consider using a heat mat to speed germination time. Keep the seeds moist but never soggy. Allow air circulation to prevent mold formation, but cover with plastic if there is any risk of drying. Depending on the variety of tomatoes you are planting, moisture level, and ambient temperature, expect your seeds to germinate within four to 14 days. Your tomato seedlings are ready to move to their new home in the vegetable garden when they are eight to ten inches (20 to 25 cm) tall with dark green, healthy leaves, a sturdy stock, and good root development. Depending on your variety of tomato and indoor growing conditions, this usually takes three to five weeks of growth after germination. Once you know how to start tomato seeds, there is no limit to the number and variety of tomatoes you can grow.